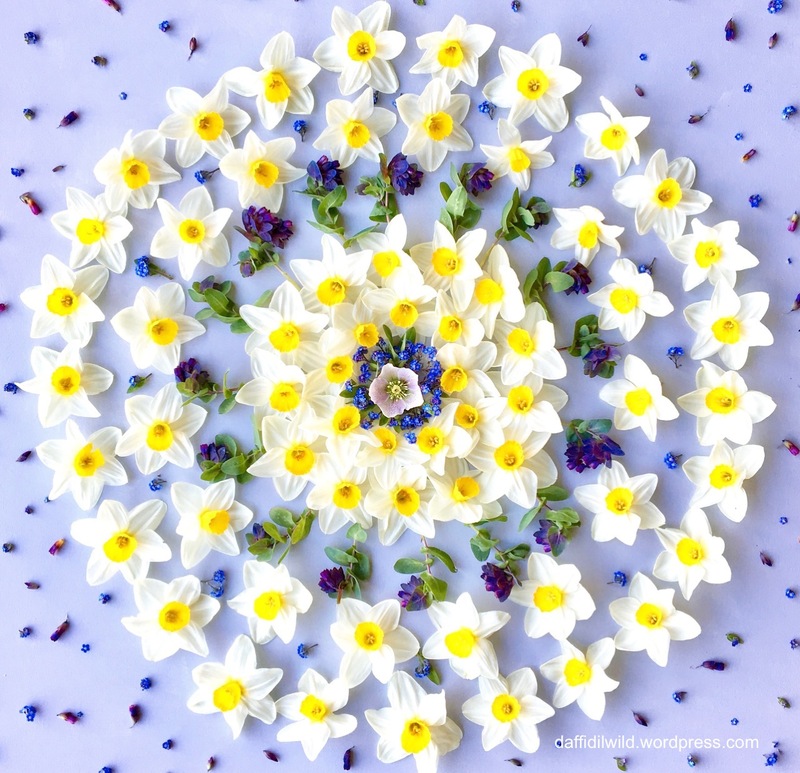 This entry was posted in art from natural objects, garden, mandalas, Vase on Monday and tagged cerinthe, flower mandala, flowers in your hair, forget-me-not, hellebore, In a Vase on Monday, mandala, narcissi. Bookmark the permalink. That field of flowers is just spectacular, and your arrangements are stunning….card worthy! I love this post, Sandra! Your daughter certainly selected the right house to move into. Your mandalas, as always, are beautiful. I’m so glad you enjoyed it Kris. Thank you for your kind words. What a beautiful sight to look out at! It is glorious – especially at dusk when they glow iin the fading light. Is your daughter growing them commercially? I do love daffs. They were planted years ago by the previous owner, she is selling picked bunches in the local Farm Shop. We are all trying to think of ways they could be a viable commercial venture in this modern world. Any ideas? I have only one word WOW!!!! Your daughter is so lucky to have those beautiful flowers in her back yard. Great phots! Thank you – yes she is! She LOVES them. 🙂 😉 yes, they can be elusive can’t they. I like the link with cake decoration. There is something wonderful about abundance isn’t there! Thank you Del, do you mean you have made cards to sell? I wasn’t sure about the blue walls at first but they do look very smart and in reality the colour is even better. Colour wheel blue is opposite to… 😉. So it is a natural! It is rather special isn’t it and at night they glow! 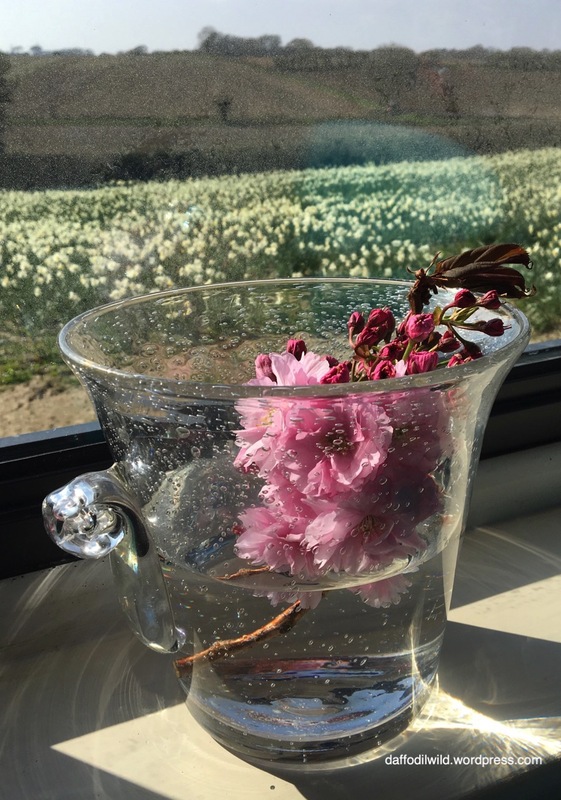 What a view from the window – your daughter will always be looking forward to Spring. Your arrangements are gorgeous and, before you ask, yes! they would make beautiful cards. That field of daffodils–wow! 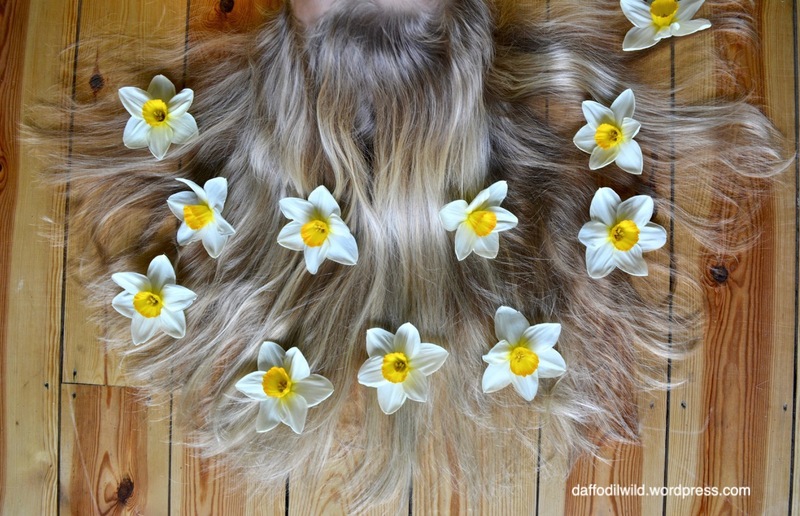 The photos are beautiful and creative–I love the daffodils with the background of yellow tresses. ‘Tresses’ that was the word I was searching for! So glad you enjoyed the photos – we had fun creating them. Fabulous photographs all of them. As you know I love fairies!!!! One came to visit last year with inspiration and it is being multiplied as evidenced by my offering this week. Is the field part of your daughter’s territory? 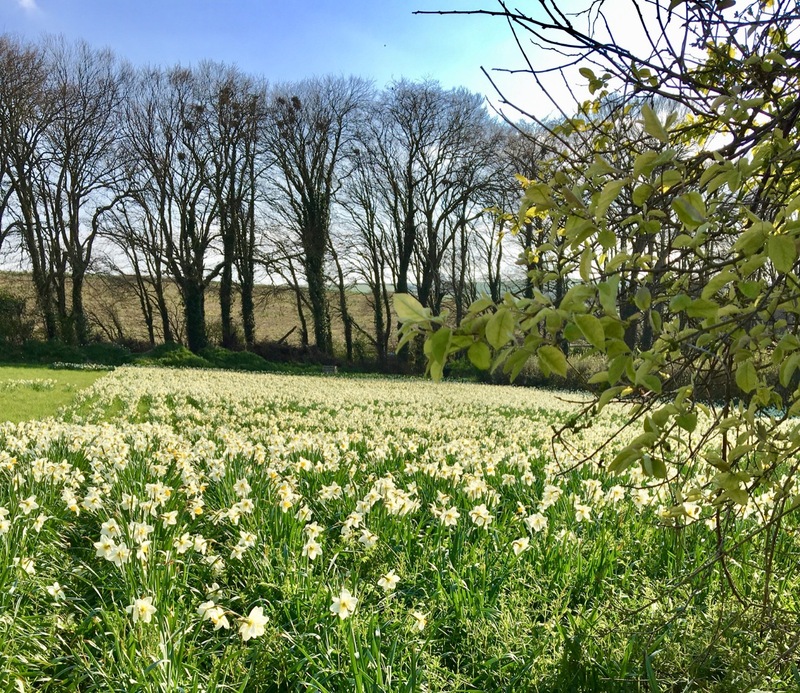 The field of narcissi is part of my daughter's territory – she and her husband are farmers and have recently moved into a farmhouse in the middle of what was a market garden – only the narcissi remain. Meditative way to create, Sandra. Lovely to imagine living among those fields. I do lose myself when making mandalas. 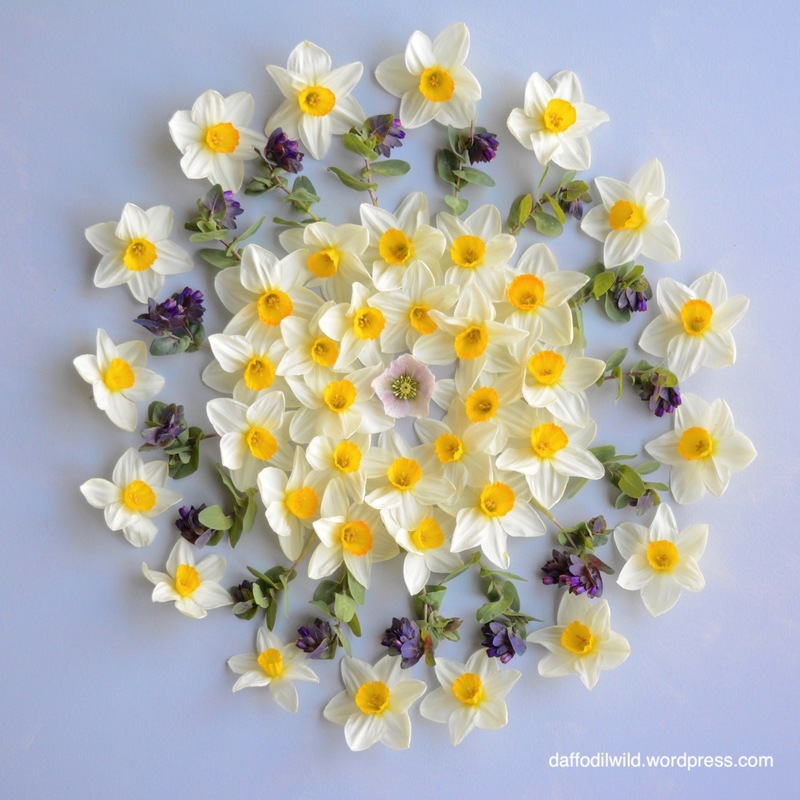 On a still warm sunny day (we haven’t had many of those so far this spring) – the scent of the narcissi is delicately heady. Such abundant loveliness and creativity you have treated us with this morning! Beautiful! What a lot of narcissii, unbelievable. It is wonderful to be able to revel in the abundance of blooms! Thank you Cathy, I really appreciate your comment. Beautiful flat lays – that must take you hours to do! I’m admitting to some springtime envy over your daughter’s dwelling!! What a wonderful sight to herald the coming of the better weather. 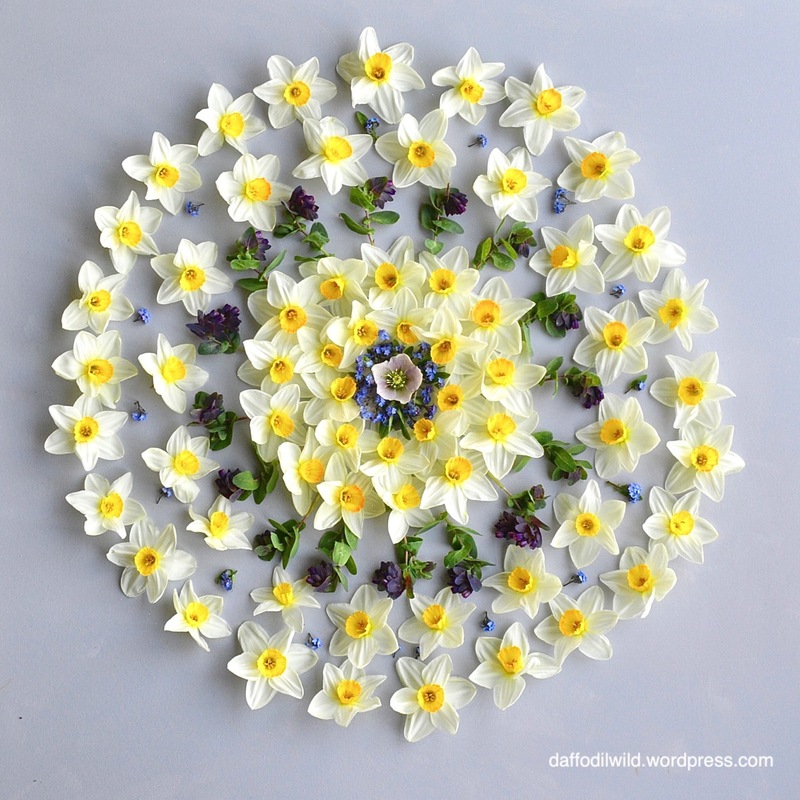 It took me about 2 hours to do the narcissi mandala. I did it in the morning before we went to the beach for the day, so I didn’t have the best light for the photographs – I have spent nearly an hour editing the photos! I’m so happy to see my daughter in her new home – it has been a long and stressful time to get there, so to see them all enjoying it so much makes my heart sing. Beautiful 😊 They bring a smile to my face every time.